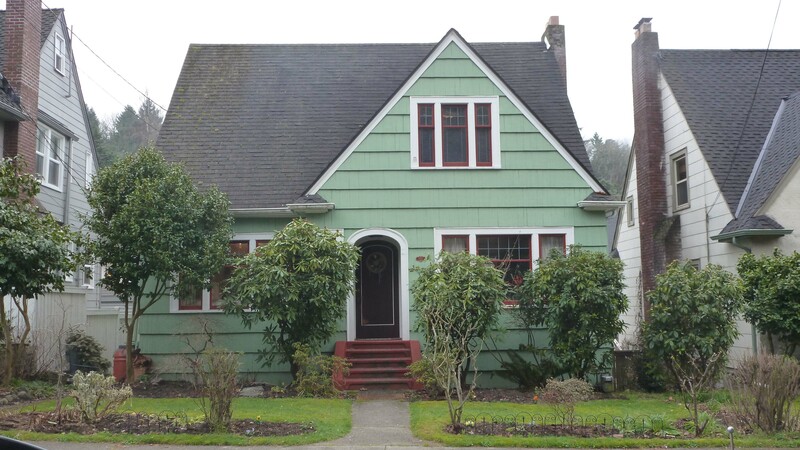 This is an intact example of the Tudor Revival style, and is a contributing element to the Montlake Historic District. The earliest known owners (1928) were Kenneth B. Edgers, a dentist, and his wife Lois; they remained here at least through 1938. The home was owned by George L. & Mae Nixon in 1948; he was a cement contractor. The owner in 1958 was Anita M. Panattoni, who worked at Crawford's Sea Grill. This 1.5 story house is generally square in plan, is clad with combed shingles, and has a side gabled roof with a front gabled wing and returned eaves. The entry vestibule is recessed beneath the front gable eaves, with a rounded door and surround. It is nearly centered on the front (north) façade, Flanking the entry are sets of ten-over-one fixed sash windows with 4-over-1 casement surrounds. Beneath the gable peak on the second story is a set of smaller six-over-one fixed sash windows with 4-over-1 casement surrounds. Secondary facades feature similar materials and fenestration. An exterior brick chimney is on the east wall.